NFL games are often decided by which team can best exploit the weaknesses of its opponent. A prudent part of handicapping the NFL is finding the biggest statistical mismatches and determining what impact they will have on the result. With that in mind, each week in this space you will be provided an in-depth look at some of the biggest mismatches on the NFL slate. Adrian Peterson has led the Vikings to the sixth-ranked rushing attack in the NFL at 128.3 yards per game. 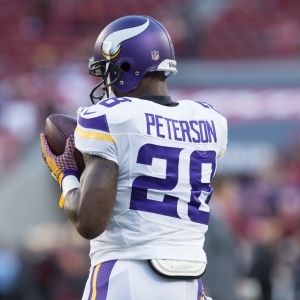 Peterson also ranks sixth among all runners with 88.3 yards per game. This week they get a Bears defense that ranks 25th against the run. Chicago has allowed an average of 124.8 yards per game on the ground this season and now will be without two of its stalwarts along the defensive front in Jeremiah Ratliff and Ego Ferguson. The Vikings figure to have little trouble moving the ball on the ground, and that makes for a long day for the Bears. The Carolina Panthers have the NFL's top rushing attack with 144.7 yards per game. It's also among the most dynamic given the running ability of Newton at quarterback and the two-headed monster of Stewart and Tolbert. Stewart ranks seventh in the NFL with 70.5 rushing yards per game, while Newton has averaged 4.5 yards a carry and chipped in an additional 40.8 yards per game rushing for the Panthers. Carolina now faces a Colts team that ranks 26th against the rush, having allowed an average of 122.7 yard per game. Last week, Indy was particularly atrocious in that department. Mark Ingram and the Saints ran wild to the tune of 183 yards and three touchdowns. The total of eight rushing touchdowns allowed this season by the Colts is tied for the third-most in the NFL. Drew Brees and the Saints rank third in the NFL with 297.0 passing yards a game. This week they face the league's third-worst pass defense in the Giants. New York has allowed an average of 288 yards per game through the air and 11 touchdowns, which is tied for the second-most in the NFL. A big part of the Giants problem has been the lack of pass rush. Their nine sacks on the season is the second-fewest in the NFL. Brees hasn't been his normal consistent self this season and is no doubt on the downside of his career, but if there's ever a week to get it going this would seem to be it. The Jets have the NFL's top defense against the run, and it isn't really close. The Jets defensive unit leads the NFL in opponents average yards per attempt (3.4), rushing yards per game (71.5) and have allowed just two rushing touchdowns all season, which is tied for the fewest in the league. Oakland has largely relied on the arm of quarterback Derek Carr, and that figures to be a necessity again this week against a stout defense like the Jets. The Raiders rank 23rd in the NFL in rushing at 98.7 yards per game. However, with the likes of Darrelle Revis and Antonio Cromartie manning the corners for the Jets, the young Carr and the Raiders offense could have trouble putting points on the board.